A general ramble about things like: dishwasher sounds, online clickbait, updates to the LEP app, my recent appearances on some OPP (other people’s podcasts), LEPster meetups and some responses to recent comments on the website. Notes, links & videos available below. This will be the last episode I upload until March. Why is it the last episode until March? Videos (some stuff from my YouTube channel including some videos from nearly 10 years ago when I was younger, single and living in my London flat and I had a terrible haircut) and some more recent videos that are not on YouTube and are only available in the app. 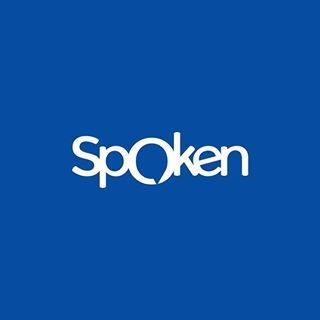 Check out the app if you haven’t done so already. I’m going to be adding more stuff there all the time. 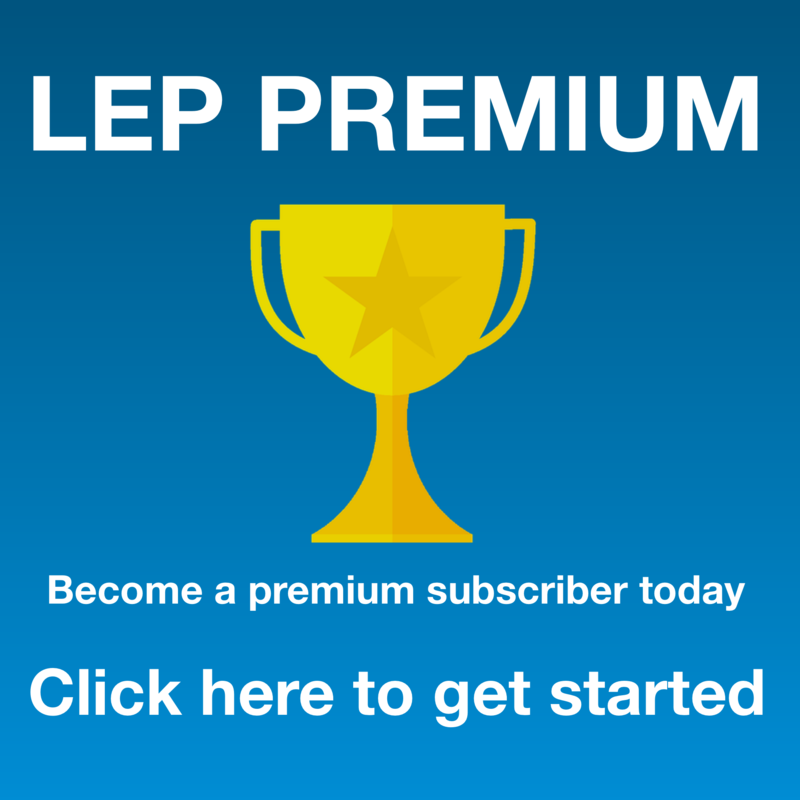 It’s more than just a place to listen to LEP. It’s a place to get loads of content from me straight to your phone. 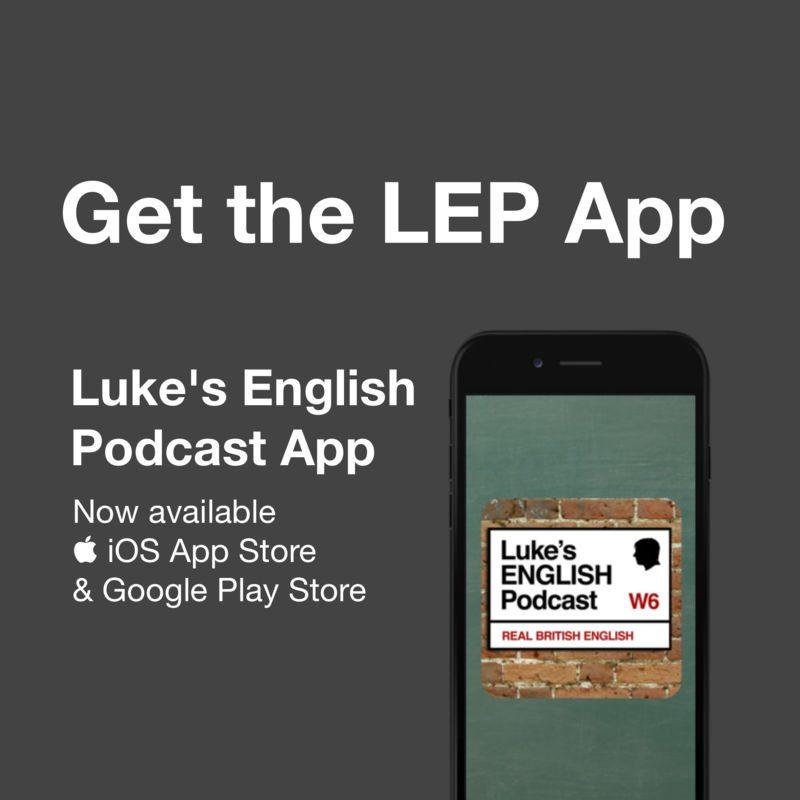 Search the app store for All Ears English Listening, or click the link below. I was on Becoming Maman – Amber & Sarah’s new podcast. Search iTunes and all other podcast places for Becoming Maman, or check the episode archive on teacherluke.co.uk – I posted it there too. In December I was on The Earful Tower talking about the Paris Metro, on the Paris Metro. 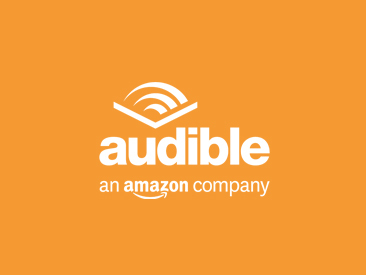 Search iTunes and all other podcast places for The Earful Tower – but also it’s in the episode archive. Planning an episode about raising bilingual kids because people keep asking “Which language will your daughter speak? Are you going to speak French to her or English? How do kids learn two languages at the same time? Also I really want to just have some stupid fun on the podcast. I haven’t been doing a lot of comedy recently, because of the baby. I’ve taken a step back because of lack of time etc, except for opening Paul’s show sometimes. I miss doing comedy – when a show goes well it is an amazing feeling, but also I feel like I’d like to refresh my material. One of the things I love about doing comedy is coming up with new stuff, improvising. Also, on the podcast – I’ve always enjoyed just messing around being a bit stupid and having some fun doing voices, or just improvising some nonsense. Haven’t done that for a while. So, I should, right? OK then. There’s a Meetup happening on Sunday 11 March 18:00 Time Cafe Geronimo in the centre of Nizhniy Novgorod. 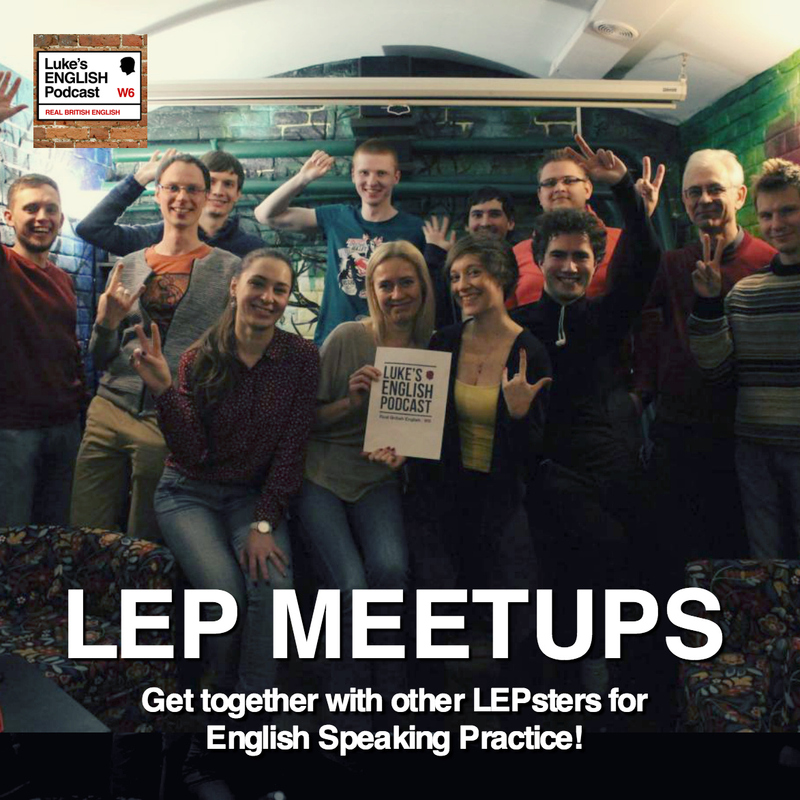 It’s been more than a year since we first established the LEP Club in Moscow. Also, last spring we launched our second Club in Saint Petersburg. Both clubs have become very popular and are now visited by a lot of people. For example, in January we had 9 meet ups and in each one there were 5 to 25 people! Luke, do you remember we also tried to arrange a LEP Club in Nizhniy Novgorod last Summer? We failed then because of the huge flood. Anyway, our LEP Nizhniy Novgorod page on Facebook has been quite popular recently. So, we are going to try again to organize the first meetup of LEPsters there. The meeting will take place on March 11 at the time cafe Geronimo right in the center of Nizhniy Novgorod. BTW, Luke, we are wondering if it is possible to place a link to all your Meet-Up groups (Tokyo, MSC, SPB) in the Podcast – it would help LEP ninjas to find like-minded friends easier! Hi Luke, congratulations to your lovely family! And thank you for sharing this wonderful story, for your genuine emotions and authenticity, for being brave enough to talk about something so private. 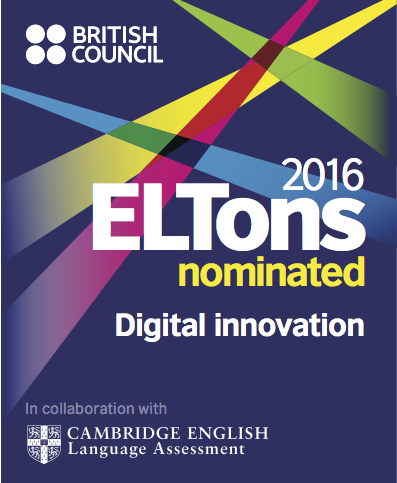 I absolutele love the ideas of comprehensible input and storytelling in language learning that you mentioned. I was listening to that episode of Olly Richards’ podcast with Stephen Krashen a couple of weeks ago thinking “If only we had a Luke’s English podcast for every language!” I think, content like this is why I enjoy learning languages in the first place – it’s a door to a different world where you can meet people, learn what they are thinking and feeling, how they live their lives and what they value. It’s an endless world of stories that you can experience. With every language you learn, you are getting a glimpse into another life, another point of view, another culture, and that is priceless. The longer I learn English, the more I think that this whole problem is more about psychology and social skills rather than grammar or vocabulary. We need more a good therapist than a teacher. My therapist is you, Luke, and this episode was a pretty successful session. My understanding and speaking have improved over the years, but very slowly. More importantly, my attitude has changed. I don’t care anymore if I don’t understand something, or can’t express something accurately. If I can avoid high expectations from others and from myself, language learning is just learning anything else, like chemistry, literature or math. You would never say that you are frustrated because of your lack of knowledge in chemistry. So why should I frustrate myself because of the language? Yes, my English is rubbish, but my chemistry also, and on the other hand, I have a lot of other skills and values that can base my self-esteem. Are you doing all right? It’s been a long time since I last commented on your website. I listened to the reasons you’ve listed to explain why you’ve not reached a level of French where you would feel comfortable to get by and I believe they make sense. As I see it, with all due respect, you’re another victim of the sway that the English language holds worldwide. English has developed to become such a powerful language that it is a no-brainer which language non-native speakers should learn other than their own. Non-native speakers have clearly a lot to gain, both professionally and culturally, from learning English. That decision has already been made for them. However, when it comes to its monolingual native speakers, English is both a blessing and a curse. Native speakers don’t have to spend years of their lives worrying about getting very good at another language if they want to succeed in business, entertainment or academia. They’ve got the grammar, the vocabulary, the pronunciation, basically the whole package by a strike of what many English learners think is luck. English speakers are just as good language learners as everyone else, but they carry a curse that is often overlooked. This curse is their own language. For a start, I don’t believe it is that straightforward for most teenagers living in the UK, the US or any other English speaking country which second language they should choose to learn. Is it Spanish, French, German or Mandarin? There’s enough research in psychology that backs the idea that when confronted with too many options, people will make poor decisions. After making their choice, people feel they have to stay motivated and overcome all the challenges that the new language poses: difficult grammar, tricky phonemes, unintelligible sounds. When any of those barriers makes itself seem insurmountable, there’s often the option to switch back to English. So, why learn another language if English enables them to get by? Another factor is that the cultural industry in English floods the whole world with its productions. By doing so, it is the richest worldwide and, consequently, they have the money available to invest in expensive projects and sell them afterwards. This is a vicious circle that stifles low-budget local productions and makes them unattractive. Take Hollywood as an example. Although people all over the globe can be creative enough to match (and surpass) the quality of Hollywood, the sheer output of expensive blockbusters guarantees that there is little to no competition from films in other languages. Why would any native-English speaker learn another language if the biggest hits of the moment are in English? Among other things, the answers to both questions I raised in the two last paragraphs constitute what motivates any English speaker to learn a second language: So, why learn another language if English enables them to get by? Why would any native-English speaker learn another language if the biggest hits of the moment are in English? While there’s good cause for some, for others there might be none. Luke, I believe there are only two ways for you to overcome the frustration of learning French and to stop making (your very good) excuses. The first is to drop the idea of learning it entirely and face the consequences. I know it seems quite harsh, but we cannot deliberately motivate ourselves to do something we don’t feel like doing. We either feel it or we don’t, that’s the way it is. The other way is to learn French once and for all. Even though I said in the previous paragraph that we cannot pretend to be motivated, sometimes we have to do things with no motivation at all. Humankind would be under serious threat if parents had to feel eager every time they woke up at night to check on the crying baby. And they recognise afterwards that the effort paid off. We will never do anything if we wait for the perfect conditions to fall into place – we live in a imperfect world after all. I would also consider whether the material you’re using is suitable for your needs. I know you’re an English teacher with many years of experience, but I think we should take every material we use with a pinch of salt. Do the books you have meet your current needs? I’m saying this because most beginner materials I’ve used to learn English and other languages seem to hinder conversation. They postpone far too much things like conditionals, subordinate clauses, how to use ‘but’ and ‘because’. If I do not learn those things early on, I’ll not be able to show reasoning and, consequently, I’ll the dumbest person there can be speaking that language. Feeling dumb is one of the biggest confidence killers for language learners. By the look of what you have told us, I would go for improving my conversation skills if I were you. This is what will give you the confidence boost you need to soldier on. You need to find someone who takes a professional approach to teaching conversational French and allows you to speak freely. Maybe a teacher on Italki, I don’t know, but definitely someone outside your social sphere. That way, you’ll be able to keep French learning issues and personal matters apart. The last thing you need here is to listen to judgemental people who don’t know what they are talking about. Please make as many mistakes as you can because Luke version 2.0 will not develop without them. Do a 30-day challenge of learning French and record yourself speaking every day to keep track of your progress. I hope I might have been helpful somehow. I absolutely loved and enjoyed it! Thank you, Luke! And I do feel like an imposter now. I’ve decided to take a CAE preparation course. I passed the test which gave me the right to take the course but I can’t stop feeling that l’m much worse than others who is doing it but I hope that I’ll survive and get better! that was another really good subject for an episode and I imagine that many of the listeners are comedy fans as well. You mentioned some of my favourite British comedy characters, like David Brent and Alan Partridge. Only last year I discovered and particularly enjoyed some actors (and writers) from the IT Crowd’s cast, like Chris Morris, Matt Berry and Richard Ayoade, who I found out is also a quite talented director – I recommend ‘Submarine’. I hope you’ll make a similar episode about interesting not-necessarily-comedy British radio shows, because I’m having some trouble finding any. Also, I’d like to listen to you talk about the Flight of the Conchords and the kiwi accent sometime. (About “Life’s Too Short” with Ricky Gervais) I’ve never watched a full episode of the show but I’ve seen this video an infinite number of times over the last 2 weeks and I can’t help laughing really hard every single time. King, convey my regards to uncle Rick, please. And tell him that he is a very consummate and eloquent speaker and presenter. I´m glad you chose philosophy as subjet of your podcast. Besides, you made it really amusing. Basically you talked about “how should we live?”. I prefer another topic: “know yourself”. Maybe it could be interesting for another podcast in the future. Cheers from Spain! By the way, if you could hear my neighbour´s laugh, I bet it would change your mind about the most annoying laugh in the world. And besides he is actually crazy. 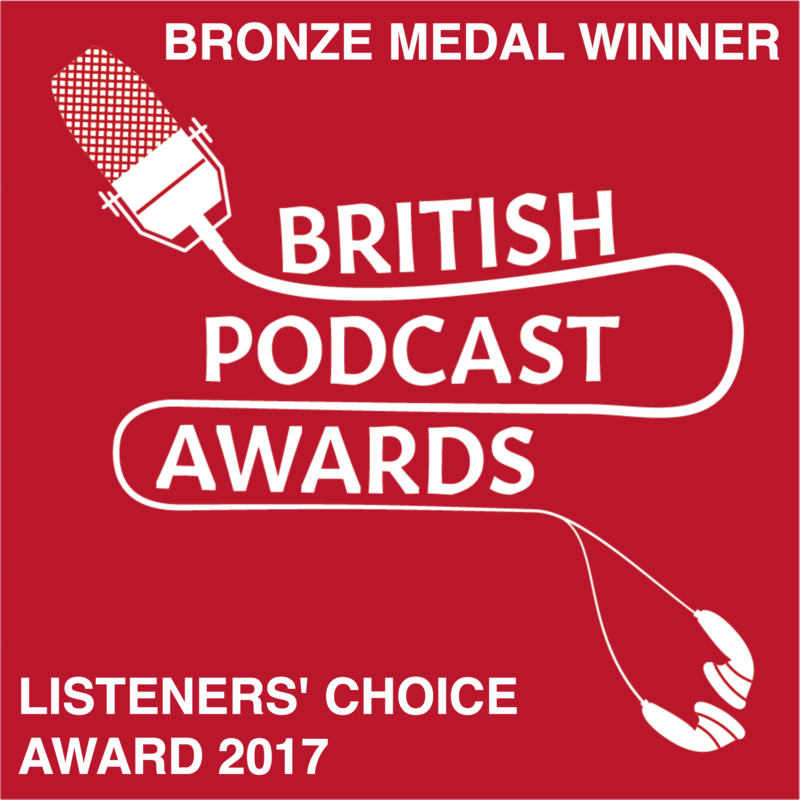 Thank you PodPALs, I enjoyed listening and playing same test with you. I ended up with the same philosophical school of thought, “scepticism”. When I first listened the episode 509, I was confused and I felt even if it was Japanese, I think I would struggle to understand. But after the episode 510, 509 is more interesting to listen and I feel easier to understand. WE NEED both FUN and SERIOUS episodes! This entry was posted in Hello, Messages from Listeners, News, Personal, Podcast Information, Ramble and tagged english, learn, podcast on February 23, 2018 by Luke Thompson. Celebrating 500 episodes of LEP with a mega-ramble featuring lots of messages from listeners, expressions of gratitude, a cool announcement for all my listeners, some singing, some talk of becoming a dad, the future of the podcast, Star Wars, and loads of fun and good times. Thank you for listening! Parts 1 & 2 are both available on this page. Thank you to everyone who took part in episode 500 by sending me a message. This became a massive celebration. I didn’t expect to receive so many messages. Thank you for all of your kind words, support, and joyful sentiments. I really appreciate it! Thank you for listening to my podcast all these years. It means a lot to me. I’m looking forward to making more episodes in the future. Seasons greetings for the festive period and have a Happy New Year! This entry was posted in Hello, Love, Messages from Listeners, Music, News, Personal, Podcast Information, Ramble and tagged english, learn, listen, listening, podcast on December 17, 2017 by Luke Thompson.